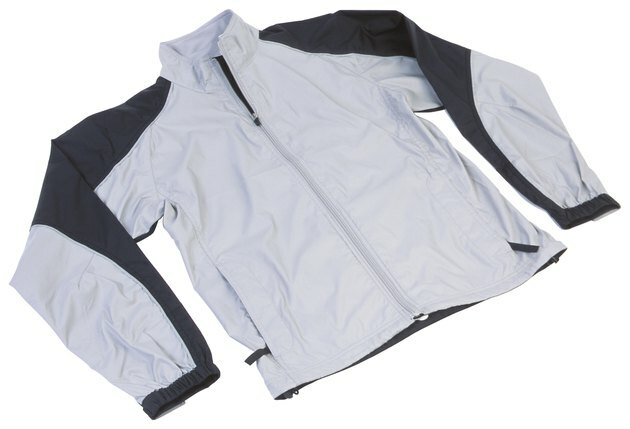 Waterproofing a nylon jacket and other synthetic or natural materials is a great idea. Even though a jacket may have been waterproof when it was purchased, the water repellent may dissipate over time. Adding or restoring the water repellent to a jacket will provide a protective barrier that water, oil and most other solutions cannot penetrate. Adding a protective layer will also make the jacket stain-resistant. Hikers and outdoor enthusiasts will be able to extend the life of their jackets and not have to replace these items as often. Test your jacket for colorfastness. Take the jacket outside and stand with the breeze at your back. Spray a small amount of waterproofing spray on an inconspicuous area of the jacket. Gently rub the sprayed area with a clean white cloth and see if any color from the jacket comes off onto the cloth. If the cloth remains white then continue to the next step. Otherwise, stop. You should not apply this treatment material to the garment. Wash your nylon jacket in the washing machine using warm water and laundry soap. The jacket must be rinsed thoroughly for the waterproofing spray to have the best adhesion. If preferred the jacket may be hand washed and thoroughly rinsed. Allow jacket to dry. Find a well-ventilated area, preferably outdoors. Breathing toxic fumes is not healthy and chemically sensitive people may want to wear a mask to prevent the inhalation of the spray. Choose an area that is not exposed to windy conditions. Hang the jacket on a hanger to ensure full exposure of the outer portion of the jacket. Hang the hanger at a height that allows for easy application of the spray. Spray the waterproofing silicone on the jacket with steady even strokes. Be sure to evenly coat all of the seams. Allow the spray to build until the jacket is evenly wet. Check to make sure the entire surface of the jacket is covered. Do not over spray or allow the waterproofing to become too heavy. Let the jacket dry until only slightly wet. Heat the jacket by one of the following methods: The best performance of the silicone is achieved by ironing the jacket on the highest heat setting allowed by the jacket manufacturer. Locate the tag inside the jacket and find cleaning instructions that should provide this information. The jacket may also be placed in the dryer or a hairdryer may also be used. The item should be completely dry before wearing. Apply a second treatment for maximum protection. Be sure to rinse all soap residue from the jacket before waterproofing. It is important to cover all seams in the clothing to prevent possible leaking. Individuals with respiratory problems should wear a mask to avoid breathing silicone spray fumes.